This section will guide people through the process of using the RPGMaker Trans to patch or start a translation of a game. To patch a game, the first step is to select the game to patch. RPGMaker Trans will automatically detect games that are in it's directory and these will appear in the dropdown menu. Otherwise, press the first Browse button, under Game Location and select the game on your hard drive. You now need to select the patch to apply. 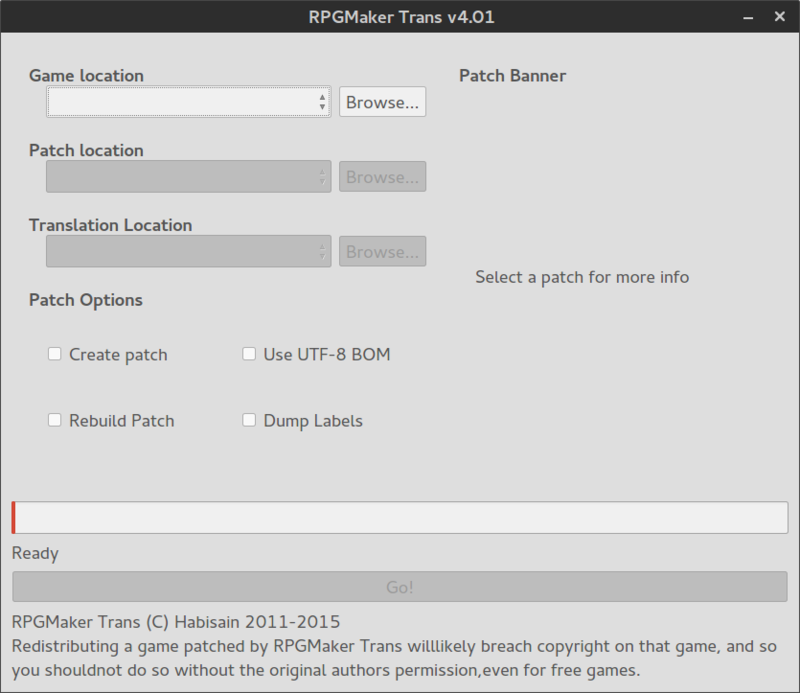 If the patch is named according to the RPGMaker Trans patch convention of Gamename_patch, and the game and patch are in the same folder, RPGMaker Trans will find it automatically. Otherwise, press the Browse button under Patch Location and select the game. Once a Patch has been selected, the Patch Banner will be displayed - assuming the patch contains one. The Patch Banner allows a translation author to display some information to the user, so it may be handy to read it. Now you're almost done. RPGMaker Trans will default to putting the translated game in the folder Gamername_translated. If you want to change this, press the Browse button under Translation Location. In any case, to start the patching process, just hit the big Go button at the bottom and wait until the progress bar reaches 100%. If you want to create a patch, simply select the game you wish to translate, then select the Create Patch option and press Go. By default, the patch will be placed in Gamename_patch, although any empty folder can be selected if you wish. From here on out, consult the Patch Format Docmumentation. All patch options have tooltips providing more details. A summary is provided here. Use UTF-8 BOM: The UTF-8 BOM is not recommended, but certain Windows software likes it. If patch files aren't displaying correctly in your favourite text editor, try ticking this option. 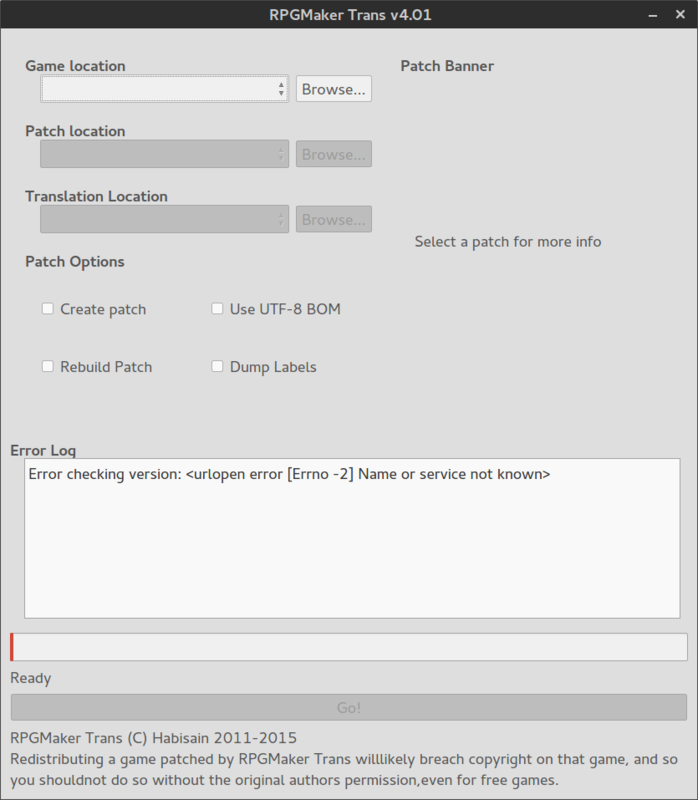 Rebuild Patch: This option causes RPGMaker Trans to rebuild the patch from scratch. Useful if a target game undergoes massive change or tidying up a messy patch. Dump Labels: Some games mix programming logic and interface code. If a translation breaks a game such that choices no longer do what they should, this is probably why. Selecting this option will dump labels to the patch, so they can be translated in line with the scripts that were modified. 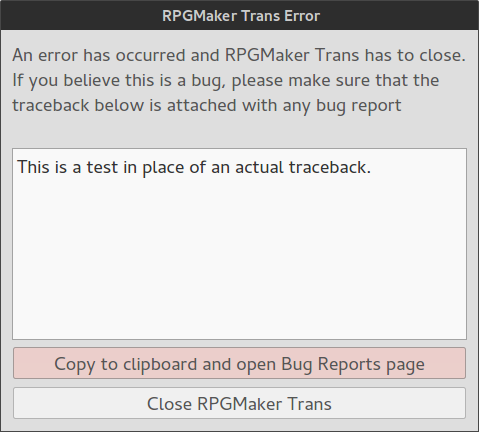 If things go slightly wrong, RPGMaker Trans will pop up an error log. The example shows a fairly trivial error due to not being able to check an update. Hopefully you won't see anything worse than that. If things go catastrophically wrong, RPGMaker Trans should display an error like the one shown below. These error messages almost always indicate a bug in RPGMaker Trans, so you should report it as a bug. Conveniently, there's a button to copy the traceback - important debug information - to the clipboard and open up the Bug Report page so you can report the bug. It's highly recommended you click the button, even if you only paste the traceback as the bug report!